In this book chapter, Orthopaedic Surgeons Steve A. Mora MD and Bert Mandelbaum MD, focus on major problems involving articular cartilage injury in the athlete’s knee. 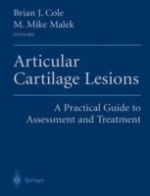 This chapter is part of a greater body of work in the textbook Articular Cartilage Lesions Edited by Dr. Cole and Dr. Malek. Chondropenia is the beginning of the spectrum of cartilage degeneration leading to degeneration. Numerous methods to treat damaged cartilage is covered including cutting edge procedures. This cutting-edge text to fill the void in the literature regarding the management of articular cartilage disease and meniscal deficiency of the knee. The book enables orthopedic surgeons to develop an evidence-based decision-making framework that guides the management of articular cartilage lesions. Carefully chosen contributors provide readers with a practical background in articular lesions, patient assessment, and management strategies. Subsequent chapters address the gamut of current surgical techniques, from arthroscopy and debridement to unicondylar arthroplasty, in a step-by-step manner. More than 500 detailed illustrations, many in color, help readers understand and master treatments. Case studies, which include preoperative planning and postoperative outcomes, reinforce the decision-making process. Nearly every permutation and treatment option is covered, making this text a prime resource for surgeons committed to exercising sound judgment. Drs. Cole and Malek, recognized leaders in the field, wrote this cutting-edge text to fill the void in the literature regarding the management of articular cartilage disease and meniscal deficiency. The book enables orthopedic surgeons to develop an evidence-based decision-making framework that guides the management of articular cartilage lesions. Carefully chosen contributors provide readers with a practical background in articular lesions, patient assessment, and management strategies. Subsequent chapters address the gamut of current surgical techniques, from arthroscopy and debridement to unicondylar arthroplasty, in a step-by-step manner. More than 500 detailed illustrations, many in color, help readers understand and master treatments. Case studies, which include preoperative planning and postoperative outcomes, reinforce the decision-making process. Nearly every permutation and treatment option is covered, making this text a prime resource for surgeons committed to exercising sound judgement.